Deviled eggs are classic little things that can be spiced up in a medley of ways. In the end, you can always top them off with fresh dill, salmon, sausage, pulled pork, crab, horseradish, cauliflower hummus… Of course, not a pile of ingredients at once, just take it one egg at a time. Plus, there is no right or wrong way to create them, making them the perfect recipe for beginners and advanced cooks alike. But wait, we missed an ingredient. Bacon. You can never go wrong with streaky bacon. With eggs as the main ingredient, you are going to want to source the best possible – after all, the quality of the bird’s feed and living environment reflects the quality of nutrition you receive from the egg. Eggs from free-ranging chickens are much higher in omega-3 fatty acids, not to mention that they contain at least fifteen essential vitamins and minerals, including B12 and selenium. It is always good to know some Paleo meals, by memory alone, that are budget-friendly and easy to prepare. When you are stuck at the grocery store without a dinner plan, you can visualize a simple list of ingredients and make this your number one backup meal, just add a salad and you are ready to go. 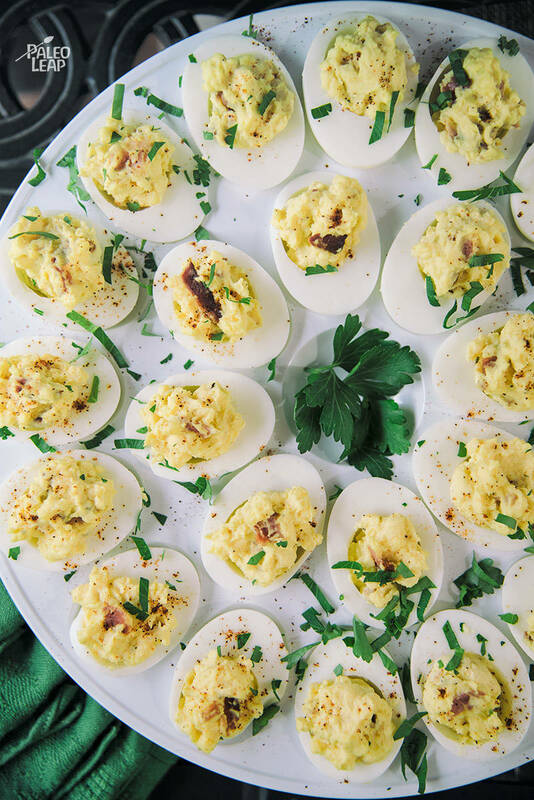 You can even prepare these deviled eggs ahead of time to take to your next work party, just don’t forget the bacon. All other matters of fish and fresh herbs are negotiable. Place the eggs in a pot of cold water. Let the water come to a boil, and immediately turn it off, let the eggs cook 12 to 15 minutes undisturbed. Drain the water and peel the eggs under cold running water. Fry the bacon over a medium-high heat until crispy, about 4 to 5 minutes. Then mince the cooked bacon into tiny pieces. Cut the eggs in half lengthwise, and remove the yolks. Place all the yolks in a medium bowl, and set the whites aside. Mix the mayonnaise, paprika, Dijon mustard and bacon bits with the egg yolks, stirring until creamy. Season to taste. Fill each egg white with the yolk-bacon mixture, about 1 tbsp. in each. To serve, sprinkle the eggs with paprika and fresh minced parsley to taste.